Last night, I had some friends over at my dorm after dinner. We gossiped for a bit about friends, boyfriends and exes and somehow got on to the topic of Tinder. One of them decided to go on her Tinder account to show us the glory of online dating.. or more like online rating. The app connects to the user's Facebook, but one has the choice whether that means taking a few photos from their Facebook Timeline or their entire life story include their relationship status, likes, interests, about me and friends. The app lets the user swipe left if "no", they don't like the suggested match or swipe right if "yes", they find the suggested match attractive. If the other user swipes "yes" for you too, then you will have a "match" and a chat will automatically be set up for you to communicate with this matched person. It sounded easy enough, sort of intriguing, I'm currently in a long term relationship so it wouldn't matter and by this point my other friend also downloaded and signed up for Tinder and she is in an even longer long term relationship. For the next hour (I swear, it was an HOUR) or so, we sat on my bed swiping "yes" or "no" on our phones and making the occasional, "EW he just messaged me! ", "Um, wtf is up with your picture", "Whoa he's a model! ", "OMG that guy is in my bio class!" "Ha, mirror selfie? No." Other than that, we did not converse for the rest of the night. Tinder is an addicting, your-self-respect-is-diminishing-by-the-minute black hole. "Hey what's up? are you from Brooklyn?" "I had a friend named Erin...bad things happened to her though :( I'm sure you won't choke on it like she did"
Fair enough. My account was only active for about 4 hours so I guess it could have been worse. I had one picture posted, my current Facebook profile picture of me standing and smiling over the Brooklyn Bridge, but most people had 3 or 4. I questioned those with more than four pictures, especially guys...because, really? Initially, I had a lot of fun playing this game. It was honestly sort of a self-esteem boost whenever I would get a match. Your success in the Tinder fantasy world is solely based on physical attraction and every match you got was just the other person saying, "I think you are attractive. Yes." It made me wonder how many people actually judge a user based on what they posted about themselves over their actual physical appearance. I surely read every single "about me" section and made sure their post was grammatically correct before moving on to judge their looks, but that's just me. Is this what dating will be like in 20 years? 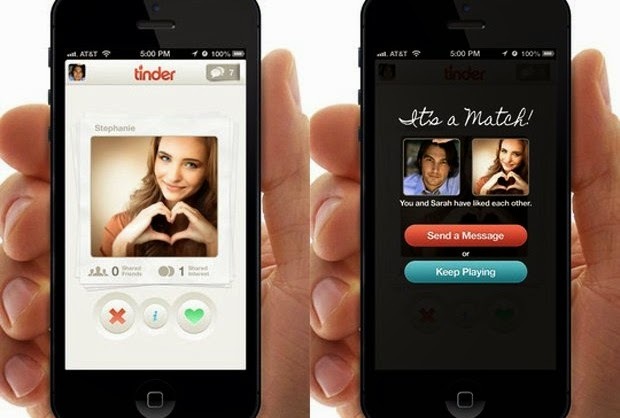 Will everyone be sitting in front of electronic screens swiping "yes" or "no" for potential matches instead of actually going out and meeting someone the old fashioned way? Will the human connection stem from a stupid, online game? If so, I don't know what to think. I guess my faith in humanity will slowly diminish, while the question of dating will be reduced to "yes" and "no".